As you probably know, CAMRA’s recently asked its members to vote on the organisation’s overall policy and direction. There are some interesting things about this vote. One is that – despite the heading in the leaflet that’s been sent out – we’re not being asked what CAMRA is for. The question being asked is who CAMRA is for – who should CAMRA represent in future? If you’re someone who feels very strongly about the English pub, that’s how you’re going to answer this survey – regardless of whether you believe that the future of the pub would best be served by the reintroduction of the Beer Orders, or by having all ‘failing’ pubs compulsorily purchased and ownership transferred to J. D. Wetherspoons, or by the repeal of the sm*k*ng b*n, or for that matter by leaving well alone. This is odd – it’s not as if they were short of space on the form. I anticipate a victory for the status quo, particularly given the multiplicity of alternative options (not to mention the absence of the c-word). What was more interesting – although it’ll probably be even less influential – was the ‘free text’ question, giving us the opportunity to explain why we were voting as we did. Naturally, I took the opportunity – and, half a second after I pressed Enter, I thought ‘this would make a nice quick blog post’. Alas, my words had already disappeared into the ether, but here’s what I think I said. Can ‘real ale’ be defined consistently and comprehensibly? If so, is ‘real ale’ – as we’ve just defined it – a good thing? And if it is a good thing, does it need any support? If the answer to these three questions is Yes – as I believe it is – the survey answers itself: there is such a thing as real ale, it is a good thing and we still need a campaign for real ale. If CAMRA turned its back on cask beer – to embrace beer in all its forms, or to represent all drinkers – then we’d need a new campaign for real ale. Since there is a Campaign for Real Ale, it seems only economical to use the one we’ve got. NO (reluctantly) to campaigning for cider and perry; the definition of ‘traditional’ cider has never been a good match to the definition of ‘real ale’. Besides, APPLE is reaching the point where it can function as a separate organisation; let them sort it out. I’d also vote NO to giving any official endorsement to ‘craft beer’ (unless it’s real ale), for similar definitional reasons. In any case, a campaign for craft beer might or might not be needed, but the Campaign for Real Ale isn’t the place to start it. And NO to denigrating any other beer purely because it isn’t real ale. Nobody at leadership level in CAMRA does this anyway, but we could do with getting the message out a bit more clearly. This last point is one I feel strongly about, although perhaps not in the way you might expect. I drink keg beer fairly often – including the kind that’s not ‘real ale’ – and when it’s good I’ve been known to rave about it. I’ve even had a couple of keg beers I’d class as better than their cask equivalents. But that’s me as a drinker, not me as a CAMRA member. I don’t think CAMRA should be campaigning ‘for’ good keg beers – not even those two – any more than CAMRA should campaign for particularly good types of gin or wine or coffee. What we can expect from CAMRA, though, is that it doesn’t campaign against beers without good reason. At its core CAMRA is a single-issue campaign – and, despite how specific it is, ‘real ale’ is the best way to give that single issue a focus. But it’s a campaign, not a cult. What we want, if we’re members of CAMRA, is more, widely-available, good-quality real ale. That’s probably also going to be reflected in what we drink, given the choice – but if we do range more widely, frankly that’s nobody’s business but ours. there is nothing wrong with CAMRA’s current values and aims except they are not vibrant and needy enough to get the next generation engaged. Sadly that’s a big “except” as without active members, the campaign has no future in the long term not matter what it supports. If CAMRA doesn’t change *something*, then it’s almost signing its own death warrant. A few thoughts in response. Firstly, CAMRA isn’t going to run out of members any time soon. Where we do have a problem is in converting fee-paying members to active members – but that’s a problem faced by membership organisations of all kinds. In these days when nobody ever needs to face an evening with nothing to do and no social contact, the allure of serving on a Branch Committee or similar is necessarily reduced. In any case, if the problem is how to engage people who are already members of CAMRA, why should we imagine that adopting new values will do the job? Secondly, let’s suppose that CAMRA membership – not just active membership – is heading for a demographic cliff, as the bus-pass contingent near the end of their drinking career, to put it no more bluntly than that. (I don’t believe this is the case, but I may be wrong – I haven’t seen the figures.) Does that mean CAMRA needs to attract young people? This is the usual conclusion, but it doesn’t follow. To see why not, look at the age profile at the average beer festival on a busy day – which is to say, everything from 18 to 80, with a bulge in the mid-20s and another in the 50-70 region. Then think what the age profile of CAMRA would look like if we were massively successful in recruiting under-25s, every year for the next ten years. It wouldn’t just keep CAMRA going, it would transform the organisation completely. I’m not saying this would be a bad thing – it might be a very good thing – just that nobody is actually arguing for it: nobody is saying that we need to turn into an organisation consisting mainly of young people. But if we directed all our recruiting efforts to young people – and if we got it right, which is a big ‘if’ – then that’s what would happen. In short, changing our values to appeal to young people is a complete shot in the dark – but, fortunately, we don’t need to appeal to young people; we probably don’t even need to appeal to new members in any large numbers. We do need to ‘activate’ existing members, but – considering that these are, by definition, people who joined CAMRA with its current aims and values – changing the organisation’s values isn’t going to be the way to do it. In fact, the more I think about this ‘revitalisation’ exercise, the more I don’t know what’s going on! I can’t really be bothered doing a full-on Golden Pints for 2014, not least because I’ve no idea what I’d put in most of the categories. (Best bottled beer? I did have a Rochefort 10 over Christmas, but was it my peak bottled beer experience? Set and setting…) Anyway, here are some random thoughts about last year, jammed awkwardly into an ‘awards’ format. It is, after all, only blogging. Cask Beer Of The Year Spingo Middle. No, Special. No, Middle. I think. Or maybe the Special. (When can we go to Cornwall again?) Runner-up: about half the Blackjack beers I had this year. Keg Beer Of The Year Electrik/Blackjack LFO (and not only because I was muttering “Ell, Eff, Oh” for the rest of the evening). Runner-up: Wild Fresh. Worst Cask Beer Of The Year Wild Evolver, which looked and tasted almost exactly like an off pint from the bottom of the barrel. (For all I know it may actually have been off – how would I know? come to that, how would the bar staff know?) Runner-up: the other half of the Blackjack beers I had this year. Disappointment Of The Year Unreliable breweries. See also TwIshhpOTY, below. Actually reliable (and consistently interesting) brewery Of The Year Ticketybrew. I can’t believe nobody else is raving about these people yet – I’ve never had a duff beer from them, and when they’re good they’re superb. Pub/Bar Of The Year I’ll stick my neck out a bit on this one. OK, it’s a bit cavernous and lacking in atmosphere, like others in the same chain – it could certainly never be mistaken for a traditional pub. And OK, the clientele isn’t necessarily composed of people I’d choose to mix with. But the service is civil and efficient – even if there is a bit of a wait sometimes – and there’s always something decent on one or more of the hand pumps. All that and money off for CAMRA members – what’s not to like? So my vote for this year goes to the Font, Chorlton. Trend which I haven’t quite caught up with yet Of The Year Sours. 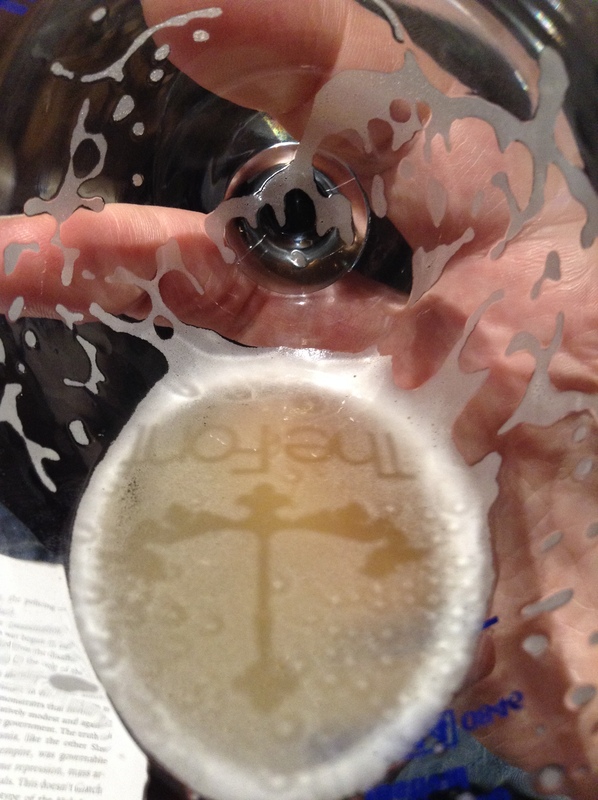 Well, I say sours – I like saisons, and I was drinking Rodenbach years ago. Full-on bretty ex-bitters, though… I’m not really there for them. Trend which I sincerely hope has peaked Of The Year I’ve called it ‘poker dice’ brewing in the past, but on reflection ‘fruit machine’ brewing is probably a better label. Pull the handle (showing my age, I know), set the reels spinning and see where they stop: red… imperial… bourbon cask… pilsner! I first started noticing beers that couldn’t be named in fewer than three words around the start of this year (they’ve probably been doing it for ages in that London); I’ve had a few, but I’m struggling to think of one that I really liked. (Hang on – Ticketybrew Jasmine Green Tea pale ale. So there’s one.) The problem with this sort of multiple-compound-style brewing, it seems to me, is that neither you nor the people drinking the beer can really know whether you’ve got it right, or got it as good as it could be. (And quite often, in my experience, it’s not – this year I loved Blackjack’s Stout and White IPA, but hated their Orange Cream Ale and Belgian Honey Porter.) There’s a craft to making a good bitter (or pale ale, or stout, or porter, or mild, or…) and a fair amount of trial and error; comparing batches of what’s essentially the same beer, and tweaking the recipe to include the best bits of different batches, is quite a big part of my idea of being a brewer. So you’ve made a hickory-smoked cranberry porter: I’m sure the smoke and the berries come through loud and clear, but is it a decent porter? Can you tell? And, more importantly, are you going to hang around to find out – or are you already busy on your imperial white IPA? I was pleased to see Pete inveighing against craft neophilia the other day; perhaps one day we’ll look back at fruit-machine styles and think “that’s so 2014…“. Book Of The Year Although the cynical young pups obstinately refuse to acknowledge that the foundation of CAMRA was a Very Good Thing, this was without doubt the year of Boak and Bailey and Brew Britannia (my review is hereabouts). Other beer books are available, but I bet they’re not as good. Spectacularly Unmet Resolution Of The Year Looking at my Golden Pints for 2013, I didn’t do too badly on I will try and stop going on about ‘craft beer’; or I will stop going on about my experience of ‘craft keg’ beers, unless it changes interestingly (e.g. I find one I really like); or even I will remember that this stuff is supposed to be fun. The one resolution I really fell down on was the one that was beer- rather than blogging-related: I will drink more session bitter. That went out the window very early on, with results which – as you’ve just seen – weren’t entirely satisfactory. Maybe in 2015. I had a bit of a revelation the other night, as I sat with a third of Magic Rock Cannonball (keg, of course). I suddenly thought: if you were Stuart Ross (or any other forward-thinking contemporary brewer) and someone suggested going down the ‘craft keg’ route… why wouldn’t you? Lots of people seem to like the stuff, and there are enough outlets that stock it, so no problem about shifting it. Then there are the positive advantages: the stability and consistency of keg would mean that you wouldn’t have to worry about the odd dud barrel, or about losing re-orders to incompetent cellaring (letting the beer spoil or putting it on too soon). As Dave Bailey recently commented, kegs are easier to export than casks, for much the same reasons. But, of course, in the craft keg bubbleworld those factors don’t obtain – there’s no bog-standard pint of wallop pulling keg prices down, and no great mass of drinkers who think it’s their birthright that beer should be both good and cheap. From my point of view, this just shows what’s wrong with the craft keg world. In particular, the idea of beer drinkers being happy to pay high prices seems all wrong: it’s like workers taking pride in accepting a pay cut. From the brewer’s point of view, though… blimey. Say you did all the sums and came out with an estimated retail price of (say) £5/pint – that would be OK! You wouldn’t need to go back and work out how to do the same thing a bit cheaper! And if the bar wanted to be a bit cheeky and stick another 50p on, that would be OK too – nobody would even notice! In short, I realised (as I drank the Cannonball) that going keg has the potential to get rid of a lot of quality worries, removing possible obstacles to repeat orders, while also gaining both the brewer and the retailer a significantly higher margin. It’s a whole new world! Why wouldn’t you do it? I understand the thinking, but I think it misses out one crucial factor. The answer to the question, I honestly believe, is “because any given beer is better from a cask than a keg (or bottle, or can)”. But those like-for-like comparisons aren’t easy to make (I’ve never seen Cannonball on cask, for instance). And sometimes, maybe, a keg beer is the one to go for. Here are some thoughts on recent encounters with keg, thinking about when – and why – it does and doesn’t work. I could taste something – just not all that much. I tried the swilling technique halfway down the glass, but it wasn’t a success. The beer didn’t so much outgas as deflate – and, since it hadn’t been ultra-cold to start with, I was left holding half a glass of warm-ish, flattish beer. Swilling didn’t do much to enhance the flavour, either, although it did liberate a blast of hop aroma in my direction – a particularly pungent, dead-leaves, old-books sort of aroma. So I had to give it another try, and the other weekend I duly handed over my £2 (for a third). And it was… quite nice. I’d certainly agree with ‘drinkable’; it slipped down very nicely. I didn’t get ‘massive’ hops, though – compared to Magic Rock Curious (which is roughly half the strength) the hops were dialled right back. It’s certainly hoppy, it’s just not “being smacked in the mouth with a hopsack” hoppy. I couldn’t say I noticed the 7.4% alcohol, either. A few days later I had a third of Red Willow Ageless DIPA (7.2%), which was on cask in another Font bar – and, I think, had been sitting around in the cask for a while; it was a bit lacking in condition and warmer than I would have liked. Despite those disadvantages, it was a massive beer – a big, uncompromisingly smoky hop attack, broadening out as I went down the glass into an extravagant flowering of citrus flavours on a dense alcoholic background. Perhaps not the nicest beer to drink – even a bit offputting on first sip – but a great beer all the same. (It was also going for £3.60 a pint, which – once you’ve taken off the CAMRA discount – works out at 90p for a third. I felt slightly guilty paying so little.) The Cannonball didn’t really develop in the same way, perhaps unsurprisingly for a keg beer: it was the same all the way through, like Blackpool rock. So you got your citrus-y aroma and your smokey bitterness, and you got a bit of alcohol (not much), all in a very drinkable, well-put-together package. It just wasn’t terribly impressive, or overpowering, or memorable; nice, but not great. For obvious reasons, really strong beers are a rarity in cask; they don’t tend to go, and if they don’t go they tend to go off. I think the strongest beer I’ve had from a cask was 8.5%: it’s a tie between Coniston No 9 barley wine (at a beer festival) and Robinson’s Old Tom. Old Tom is unusual in being widely available in Robbies’ pubs, and the brewery deserves a lot of credit for not abandoning it but building it up as a cask beer. It’s generally in pins to minimise spoilage, though – and I’m sadly familiar with the warmish, flattish, slightly metallic taste of old Old Tom! So if somebody brews a beer at 12% – stronger than many wines – the chances are you’re only ever going to see it in a small, expensive bottle; what’s more, the chances are you never will physically see that bottle, and that if you do you’ll think the price is just a bit too silly. Kegging to the rescue: someone who might baulk at paying (say) £3.50 for a 250 ml bottle may well be amenable to paying £2.80 for a third of a pint (even though that equates to £3.66 for 250 ml). At least, I was. Why Mikkeller and the ever-impressive Siren have called this beer a white stout I’ve no idea, given that all the information this really conveys is that it’s (a) strong and (b) not black. What it is, as far as I could see, is a barley wine. What it is, to be more precise, is a very, very good barley wine – a rich, dense, marmaladey fruitiness, smooth without being syrupy, heavy without (amazingly) any overt alcoholic heat. A stonkingly good beer, quite honestly, and one which I would probably never have had if I’d only seen it in bottles. You don’t want beer squirted out of a tin! a stranger in a pub said to a friend of mine, unprompted, some time in the early 70s. By and large I’d agree with that; by and large, I don’t want beer squirted out of a tin. But, like CAMRA, I’m pro-cask rather than anti-keg; and I’m increasingly finding that there are times when the list of the best – or most interesting – things on the bar includes some beers on keg. Keg vs cask, I still think the keg is likely to be second best. ‘Cold and fizzy’ I can live with; what I’m thinking of here is more a ‘light, drinkable, rough edges shaved off’ sort of thing, not to mention the absence of the ‘developing in the glass’ thing. But if what you’re getting is something you can’t get on cask – something you would only previously have found in bottles – some of the objections become a bit academic.